Is there some facet of human personality that craves disaster? Yellowstone National Park sits atop the Yellowstone Caldera, the crater of a massive supervolcano. The park attracts millions of visitors each year to its famous geysers and hot springs, powered by the hot lava below. The Yellowstone super volcano has had three cataclysmic eruptions — 2 million, 1.3 million and 640,000 years ago, creating a series of ‘nesting’ calderas, say scientists. The inevitable next ‘big one’ will wipe out the surroundings for hundreds of kilometres, covering the US and Canada in ash, [University of Oregon geologist Ilya Bindeman] told EarthSky. It would devastate agriculture and cause global cooling for a decade, he says. A volcanic eruption of that size “hasn’t happened in modern civilisation,” he said. All of which is true, of course. And we're even told at the end, seemingly as an afterthought, that scientists are pretty sure that an eruption isn't imminent and that we'll have plenty of warning before one occurs (not that we'll be able to do much to stop it). But before getting that reassurance, we're shown a video clip of some bison "fleeing for their lives" and told that the "animals may be leaving the park because they sense an impending catastrophic volcanic eruption triggered by recent earthquakes." Well, I looked at the video, and the first thing I noticed was that the bison didn't seem particularly alarmed. I didn't get the "fleeing for their lives" vibe from them. They were more moseying for their lives, or possibly even ambling for their lives. But second, what the hell is the writer of the article trying to do by telling us in one breath that the bison were running away because the volcano is going to erupt, and in the next saying that scientists don't think it's going to erupt? 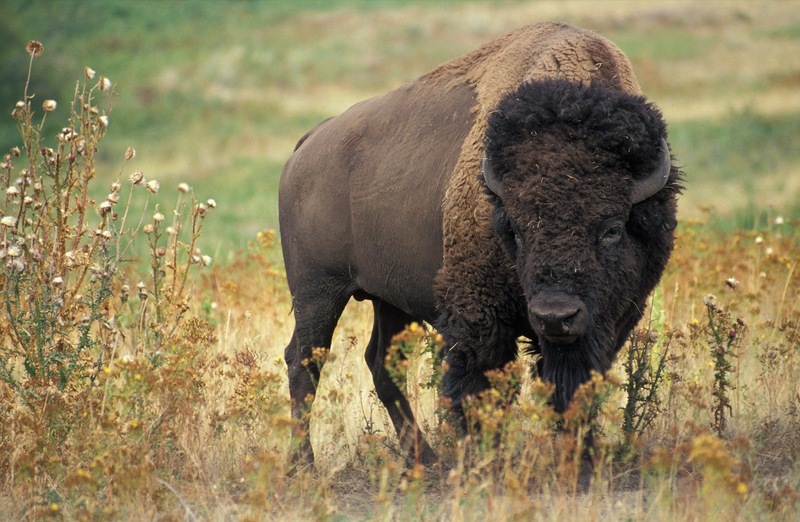 I've seen bison, and I know a good many scientists, and I think I can say without fear of contradiction that most scientists are smarter than your average bison. But we don't have a very good track record of listening to scientists, do we? I'm honestly not surprised that the American citizenry would discount what a scientist is saying in favor of prognostications by a large ungulate, given our general approach on evolution, climate change, and vaccination. Now, of course I know why the media loves stories like this; it gets people to click the links and read the articles. But I'm more mystified why the general public likes disaster stories. Since I was sent the link, I've seen the story posted three times on Facebook and twice on Twitter. Why are people so eager to spread around a bogus story (and I'm convinced that anyone that has more brains than a bowl of chowder could tell that it was bogus just by reading all the way to the end and seeing the disclaimer about scientists doubting that we were going to see an eruption soon)? So something must be appealing to people about "We're All Gonna Die" stories, but I'm damned if I see what it is. At least the other idiotic stories that you see floating around -- stories of the "Miley Cyrus Pregnant With Bigfoot's Love Chid" type -- don't leave you with the impression that civilization is about to end. Although now that I think of it, I can understand how you might pray for the apocalypse after seeing the Miley Cyrus "twerking" video. I know I did. So maybe there's some justification after all. > So something must be appealing to people about "We're All Gonna Die" stories, but I'm damned if I see what it is. Quite a while ago, I read a post (I've been trying to locate it but the Google Force isn't with me on this one) from someone who used to be in a "Doom's Day" cult, explaining why he had believed, and actually was looking forward, to the end of the world the cult leaders were constantly predicting: he wouldn't be alone. The prospect of death is probably the most terrifying certainty many of us have (and likely the impetus behind all the life-after-death myths). That you will be alone or be the only one dying when it happens only makes the prospect more gloomy. There is some sort of perverse reassurance to be found in the thought that, as scary as an event may be, it will be easier to go through it together with your loved ones and friends. I just wonder why they chose the road rather than going overland. Seems like most of the roads in Yellowstone arent really geared at GETTING OUT of the park, but rather, ambling through the park, taking you closer to the big boiling pots of volcanic water. Fear, the amygdala, and "Whistle"